An Arizona Golfer’s Dream! No other metropolitan area in the world offers more golf communities that celebrate the links life like Phoenix and Scottsdale. The area is home to over 200 private and public courses. According to the National Golf Federation, Phoenix is one of the top five golf destinations in the world and the “Golf Capital of the World”. The exclusive Robb Report named Scottsdale “America’s Best Place to Live for Golf”. Golf legends like Jack Nicklaus, Arnold Palmer, and more have chosen Phoenix and Scottsdale as the backdrop for some of their most inspired course designs. It’s no wonder that many of Scottsdale’s best real estate and most popular communities are centered around golf courses. In Arizona golf communities, the golf course is about more than just the game. It’s where business takes place, where friends and family unwind, and where people retreat for a weekday escape from the daily grind. Along with some of the most beautiful award-winning courses in the U.S., Scottsdale golf communities provide amenities for everyone- fitness centers, upscale dining, clubhouses, and swimming pools to name just a few. 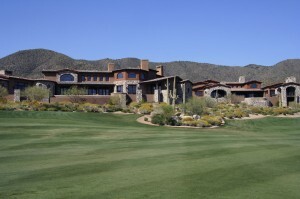 On the right you’ll find a list of our favorite golf communities within Arizona. Besides a little background and history on the golf community, you’ll find a direct link to current homes available there as well. You can refine the results to your liking by editing the search criteria (square footage, price, etc.). Better yet, sign up for a Home Finder account so you can create custom searches that will be saved as well as receive notices when new homes come on the market in the community of interest. Or, if you want to start from scratch, just visit our Search MLS page.